A Philosophy of Christian Materialism offers a new religious engagement with the public sphere via means of interdisciplinary analysis and empirical examples, developing what the authors call a Relational Christian Realism building upon interaction with contemporary Philosophy of Religion. The book argues that the current discourse on public religion is inadequate in addressing the issues now to be faced, including: material religious practice in the sphere of education; the growth of alternative political movements and the developing awareness of environmental concerns and urban social justice. Key concepts that support this strategic analysis are: entangled fidelities (the form of a materialist religious practice); the possibility of a relational Christian realism (including new developments in how we interpret key categories of doctrine including God and creation, salvation and humanity), and the post-secular public sphere (including the emerging phenomenon of postsecular rapprochement - namely the coming together of both religious and secular actors in methodologies and politics of pragmatism as well as ethical discourse for the sake of the public commons). Co-authored by theologians in both the USA and the UK, this book represents an exciting contribution to philosophy and practice of religion on both sides of the Atlantic and aspires to be sufficiently interdisciplinary to also appeal to readerships engaged in the study of modern political and social trends. 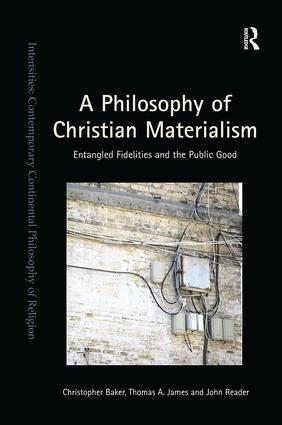 Contents: Introduction: A philosophy of Christian materialism - entangled fidelities and the public good; Relational Christian realism - the what and the why; Philosophy and Material practice: Deleuze, Latour, Badiou; Engaging the theological I: God; Engaging the theological II: creation, the human, and redemption; Practices in Christian materialism and relational Christian realism: urban community empowerment; Education and relational Christian realism; Entangled fidelities and environmental issues; Christian materialism and the contours of a new political imagination; Bibliography; Index. Revd Dr John Reader has been both a parish priest and theological author and educator over the past 30 years. Recent books include: Blurred Encounters; Reconstructing Practical Theology; Entering the New Theological Space, co-edited with Christopher R. Baker; Christianity and the New Social Order, with John Atherton and Christopher Baker; Theological Reflection for Human Flourishing, written with Helen Cameron, Victoria Slater and Chris Rowland; and Heterotopia, written with Caroline Baillie and Jens Kabo. Thomas A. James is pastor of Covenant Presbyterian Church in Southfield, Michigan. He holds a PhD from Union Presbyterian Seminary, and is author of In Face of Reality: The Constructive Theology of Gordon D. Kaufman and several articles in Political Theology, Zygon, The American Journal of Theology and Philosophy, and The Bulletin of the North American Paul Tillich Society. He served as Assistant Professor of Theology at Union Presbyterian Seminary from 2008 through 2012. Professor Christopher Baker is William Temple Professor of Religion and Public Life at the University of Chester and Director of Research for the William Temple Foundation. He has written and co-edited eight books and 30 book chapters and journal articles exploring the relationship between religion and urbanisation, the role of religion in public policy and social welfare, and the role of religion in civil society and the reshaping of church within the urban environment. Publications include: The Hybrid Church in the City; Postsecular Cities, edited with Justin Beaumont; and Christianity and the New Social Order, written with John Atherton and John Reader.